If you're looking for the outline of the Alaska you know and love, you might as well give up now. This bizarre map, which appeared in the third volume of Diderot's Encyclopédie, dates all the way back to 1772 — and it's a total hodgepodge of misinformation. Here's his [hi-res version. While some geographical features don't appear too out of the ordinary (Russia's Kamchatka peninsula, for example, is pretty easy to spot), Alaska couldn't look more out of place. 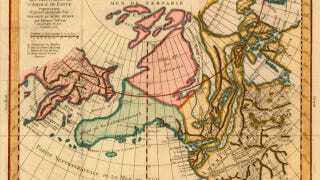 "Notice the contrast between the mostly soft-edged shores of this half-baked Alaska... and the jagged coastlines of the real parts of the world," writes Frank Jacobs, who heads up shop over on the Strange Maps blog. "The lack of detail for the former is intentional, a sign of deference by the cartographer to his lack of knowledge. Smooth shorelines are a code between the maker and reader of maps, to be read as: Not yet surveyed." [The Strait of Anian], all the more mythical for being non-existent, started showing up on maps from the mid-16th century onward... probably after a Chinese province mentioned in Marco Polo's Travels. For centuries, it was one of that handful of fictional drivers of real exploration. Others include the Seven Cities of Gold (in North America) and El Dorado (generally sought in South America). These places were always sought after but never found, and thus instrumental in pushing back the boundaries of the unknown. Too much ice and too shallow waters have always rendered this Northwest Passage uneconomical, but global warming might be changing that. When the ice retreats far enough, the mythical waterway may yet become a reality, and finally connect the markets of the Old World with the fabled riches of Cathay and Xipangu [aka China and Japan - if you were Marco Polo]. Read more about this half-baked Alaska map over on Strange Maps.